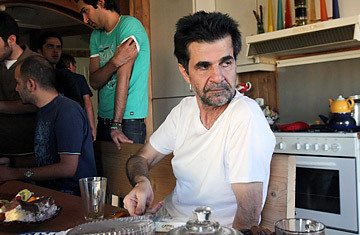 Iranian filmmaker Jafar Panahi at his home in May after being released on bail from Evin prison in Tehran, Iran. An Iranian court has sentenced Panahi to six years in prison and a 20-year work ban for propagating against the Islamic establishment. Sometimes, the truth hurts; in Iran it can get you locked up. On Monday, Jafar Panahi, director of such widely acclaimed films as The White Balloon, Mirror, The Circle and Offside, was sentenced to six years in jail after an Iranian court found him guilty of "colluding in the gathering and making of propaganda against the regime." He was also forbidden from filmmaking for 20 years. In an interview four months ago with Agence France-Presse, Panahi said, "The main question is: why should it be a crime to make a movie?" Now he has his answer: Because Mahmoud Ahmadinejad's cronies say it is. Panahi is a prominent supporter of Iran's "green revolution" that burst into demonstrations in Jun. 2009 after the national elections and was crushed a few weeks later. In late July of last year he was reported arrested after meeting fellow mourners at the grave of the demonstrators' fallen heroine, Neda Agha-Soltan. A month later, Panahi was allowed to serve as jury president of the World Film Festival in Montreal; on opening night he wore a green scarf in tribute to the struggle for his country's liberalization. The code-readers in the Iranian politburo surely took notice. Panahi had been working with fellow filmmaker Mahmoud Rasoulof on a project about "family and the postelection developments." That must have been the great crime, for Rasoulof received the same six-year sentence. Filmmakers in other repressive regimes have been convicted on bogus charges that were ostensibly unrelated to their work; Sergei Parajanov, the great Armenian-Georgian director of Shadows of Our Forgotten Ancestors, served four years in a Soviet prison for "homosexuality and illegal trafficking in religious icons." Others, like China's Tian Zhuangzhuang  who had to smuggle a print of his 1993 The Blue Kite out of the country and into film festivals  have been banned from filmmaking for years. But the Mullahs of the Islamic Republic feel no need to mince words: "propaganda against the regime" is dictator-speak for "making a film whose truth would embarrass us." For most of its 32-year existence, the Islamic Republic has had an uneasy relationship with its home-grown film industry. In the wide, cultured world outside, people knew two things about Iran: that it was a severe theocracy, and that its film directors made terrific little movies. Thus the nation's power elite tolerated its finest filmmakers. Until it didn't. In the early '90s the works of Abbas Kiarostami, who had been making movies since before the 1978 revolution, received plaudits and prizes at world film festivals, including the 1997 Cannes Palme d'Or winner A Taste of Cherry. Mohsen Makhmalbaf had similar success with his rapturously folkloric Gabbeh and the 2001 antiwar epic Kandahar (which this magazine chose as one of the all-TIME 100 greatest movies); and Makhmalbaf's daughter Samira became, at 21, the youngest director in the history of Cannes competition when her The Apple was shown there in 1998. Critics proclaimed Iran the most significant emerging national cinema since the Czech New Wave in the '60s  a grand humanist impulse crushed after Soviet tanks rolled into Prague in August 1968. Another willful little girl starred in Panahi's 1997 feature, The Mirror. Mina's mother has not come to pick her up after school, so the child figures she'll get home on her own. Halfway through the film, she suddenly shouts, "I'm not acting anymore! ", and The Mirror becomes a little chase movie, with the filmmakers in pursuit of their actress. Was this a metaphor for the Iranian female's urge for independence? That's what I wrote when I reviewed the film in TIME, adding, "Ayatullahs, beware: in a decade these Minas will be grown and ready to take over." Alas, I was too hopeful by half; the regime allowed women to serve as doctors and civil servants, but not as citizens with the same rights as Iranian men. In 2000, Panahi addressed that issue in The Circle, revealing with unflinching sympathy how a female of any age can be lost in a man's world. The film is a dexterously constructed drama about one long night in the lives of half a dozen female ex-convicts, each of whom has been imprisoned, or may soon be, for such "crimes" as riding in a car with a man not her husband. This daring, despairing, beautiful work, which won the top-prize Golden Lion at Venice, was forbidden to be shown in Iranian theaters. Panahi made two more features: the mordant heist film Crimson Gold in 2003 and, three years later, Offside, a comedy about six female soccer fans who try to sneak into a game in men's garb. It won the Berlin Film Festival's Silver Bear (and was also named one of TIME's top 10 soccer movies). The praise Panahi received from abroad must have galled the official vultures in charge of Iran's culture, and strengthened their resolve to punish one of their finest artists. In February 2010, when Panahi, his wife and daughter, along with Rasoulof and a dozen others, were arrested, the outrage was immediately condemned by Amnesty International, Human Rights Watch and the foreign ministers of France and Germany, as well as prominent directors, actors and film critics. An Apr. 30 petition from Martin Scorsese, Steven Spielberg, Francis Ford Coppola, Michael Moore, the Coen brothers and many other auteurs ended with the plea, "Like artists everywhere, Iran's filmmakers should be celebrated, not censored, repressed, and imprisoned." The following month, Panahi was to be a juror at the Cannes festival; when the government denied his passage, a chair was set aside for him and remained symbolically empty. Today he has a real seat in a jail in Tehran. In the August interview with Agence France-Presse, Panahi said, "When a filmmaker does not make films, it is as if he is jailed. Even when he is freed from the small jail, he finds himself wandering in a larger jail." This was when he thought he would be forbidden from pursuing his art, craft and life's blood. "A finished film, well, it can get banned," he said, "but not the director." Now we know a director  this most estimable one  can get banned, imprisoned, shut up and locked in. And if all the muscle of the United States and the European Union can't stop Iran from its nuclear dream, how can a directors' petition convince the Ayatullahs to give freedom to a filmmaker who dared to tell the truth about his country? See the top 10 movies of 2010.